Laptop stands are different from laptop tables or lap desks in a way that such accessories are created to give your laptop extra height from the desk surface. Usually considering ergonomics as the basis of design, functionality coming in as second, these stands become a must-buy, especially to those who have neck and back problems. Others do the purchase in order to add appeal to their office spaces while others utilize the available space for keyboards, smartphones, speakers, and other things. Which raises the question: What are the best laptop stands out there? The list we prepared considers overall appeal, functionality, ergonomics, design, and creativity. You’ll see how simple workstation accessories like this becomes a hit, especially when it helps you feel better after sitting long hours in front of your computer. Simple, clean, and functional. That’s how the mStand Laptop Stand from Rain Design is best described. Even by glance, you’ll know that the stand is tough and durable because it’s made of a solid, single piece aluminum so there are no chances of hinges and edges snapping or breaking. The design is also fluid all throughout with only curves incorporated at every detail. Because of the material, the stand is not prone to storing heat as the laptop exhausts hot air from the side and bottom fans. Thanks to its default raised and tilted design, airflow that promotes cooling is optimized on every side of the laptop in place. Though the color matches that of the Macbook, the mStand can accommodated any laptop, be it a Lenovo, an ASUS, or even an HP. It’s so sturdy that even a 17-inch Macbook Pro could sit well on the stand securely and safely. There’s also a round hole found on the middle rear section of the stand, a perfect place for wires to go through, keeping everything organized. There’s also a gap on the lower part of the stand which could be used for stashing in a keyboard, placing a speaker, whatever you think that could fit well on the gap. Even though the design of the AmazonBasics Ventilated Laptop Stand may not seem best with most design-conscious customers, everything in it serves its purpose of cooling the laptop while giving its users a flexible viewing experience. Thanks to the metal mesh platform, the stand provides natural cooling to the laptop that takes advantage of the airflow, especially when the platform is raised whether low, medium, or high. Since everything is made of metal, it’s not prone to wear and tear and can endure many hours of use and abuse. And because the parts are tough, it can carry different laptop models. For those who prefer to have their devices connected to the laptop while at bay, a six-slot cord organizer keeps the cables stationed for clean and clutter-free wired connectivity. The laptop stand offered by Executive Office Solutions is not just for laptops to stand on an office desk. They even made the legs to help the laptop literally stand when height becomes an issue of use. The legs of the laptop stand are so functional that the hinges can be rotated 360° and can be locked depending on reference with height, purpose, and utilization. With the stand made from durable materials, it can be used well, even for medium to big laptops. Whether you’re sitting down on the floor, on your office chair, or you’re standing while using your laptop, the laptop stand from Executive Office Solutions can be adjusted so that you could avoid neck strain when looking down on your laptop screen for quite some time. It’s not just the user that could avoid strain. Even your laptop can experience comfort through 2 USB fans located under the platform, which can be connected via a USB cord. 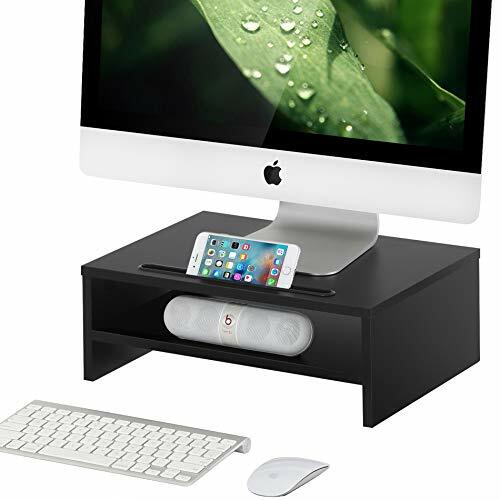 And with a side table attached on the main platform, you could use it to place your mouse, a book, your phone, or maybe a speaker. 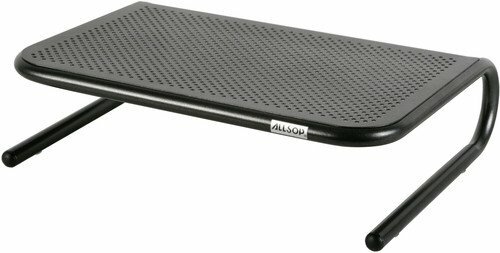 When you have a laptop or monitor that needs to be raised in order to meet your eye level and lessen the strain that you feel in the neck and back, the Allsop Metal Art Jr. Laptop Stand is an excellent option. Because of its tough build, it can carry weight of up to 18kg (40 lbs. 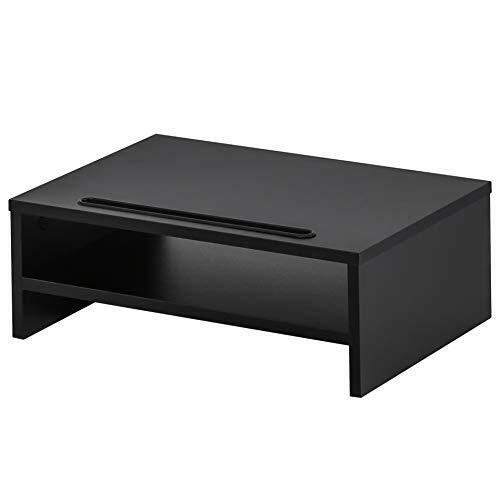 ), enough to support large flat screen TVs, heavy duty printers, and even gaming consoles. With minimal and efficient design, you could place whatever on the bottom section of the stand. You could slip your keyboard when not in use, or a speaker can be placed for convenience. The main platform in the stand has been perforated in order to promote airflow for placed devices such as laptops to lessen heating. The stand is also designed to stay in place, with anti-skid feet distributed on all four points of the curved leg. 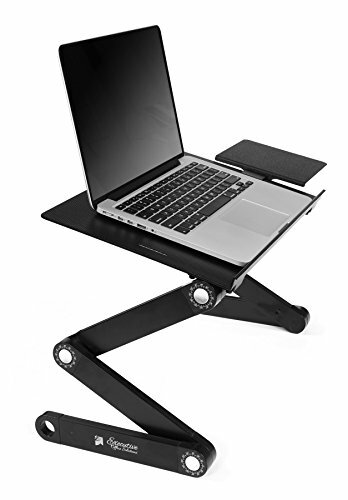 On the more conventional aspect of design, the FITUEYES Laptop Stand is for those who have so many things to place close to their laptop or monitor. It has a groove on the top section for placing smaller devices like tablets and smartphones, which has a provision for charging cables; all for convenience. It has ample space for keyboards, speakers, and anything else you could add for easy access while using your laptop or monitor. 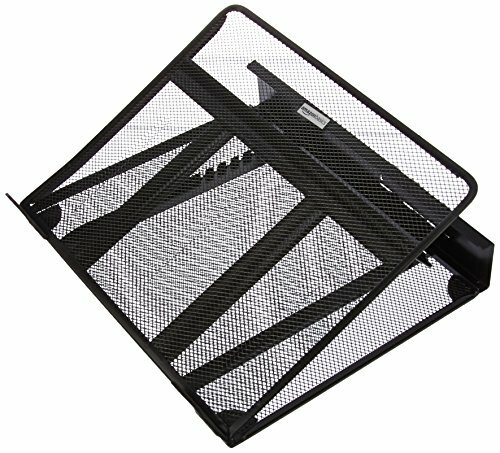 It also comes with a cable clip for organizing cables, along with a fabric basket that can be used for placing smaller things close to the laptop stand. 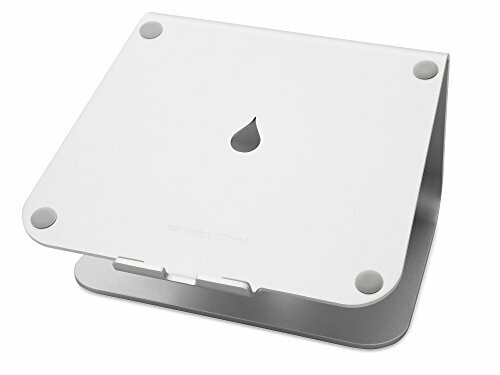 For design, it would definitely be the mStand as it goes well in any area, because it looks clean and fresh. For those who demand flexibility with their laptop stand, whether the laptop is located in the office, on the desk, or you need to stand and see the laptop eye to eye, then Executive Office Solutions’ Aluminum Laptop Stand does the trick well as it has legs that can be configured different ways. But if you need more space for storing things, the FITUEYES Laptop Stand is undeniably valuable.